Audrey died on the 19th June 2014 at New Cross Hospital. Having spent all of her life in Wolverhampton, her last year of life was spent in a residential home on the Pen Road. Reclusive by nature, she was devoted to animals, particularly her cats. Yet, in company she was always cheery and never lost her lively sense of humour. 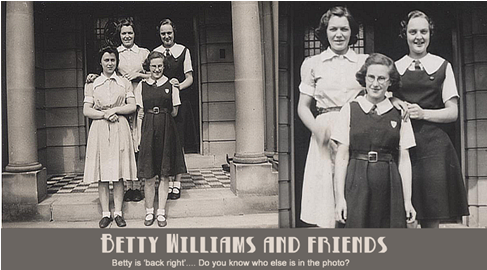 The photos on the right were taken on the school steps in the 1930s. Do you recognise anyone in the photo? Betty is back right in both pictures.